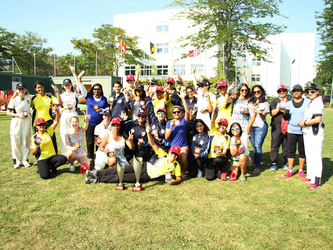 Cricket among Women is a fast growing Sport and season 2016 was a witness to the active development and engagement of Cricket among Women in Switzerland. 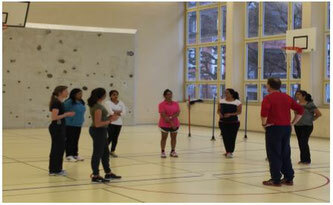 Like every BIG venture that has small beginnings, the first initiative was to introduce the Sport among young girls and Women by organizing multiple “Introduction to Cricket” sessions at the Indoor Hall in Zurich Hottingen. The key aim here was to primarily generate interest by having them experience the entire phases of a rookie cricketer starting from holding the Cricket bat to overcoming the curiosity of the sport. The obvious challenge here was to cultivate genuine interest for the Sport and at the same time to enjoy the the time spend. It was a mixed crowd of participants, with some having seen cricket, others who are new to the sport and those who have had the opportunity to play cricket during their school days. As weeks passed, the Saturday sessions became a religious affair and through word of mouth and publicity , more women started to come and try their hand at the game. At the Annual General Meeting on Saturday 27th February 2016, Cricket Switzerland welcomed newly established Zurich Sapphires Cricket Club, Switzerland's first women's cricket team, as affiliate members to the organization. What started off during the Winter of 2015 as a hobby for us women trying out the sport Cricket, has now translated into forming a club. The enthusiasm for the sport, the persistence and still not forgetting to have fun are the key reasons behind the success of ZSCC. This also the marks the debut of Women’s Cricket in the history of Cricket Switzerland as being the first Women’s Cricket Club to be established in Switzerland. The club currently constitutes a combined number of 22 active and passive members. Putting Women’s cricket on the Cricket Map within Switzerland. Attracting other Women cricketers and motivating them to take part in the Sport. Valuable Tournament Experience for the ZSCC club members. 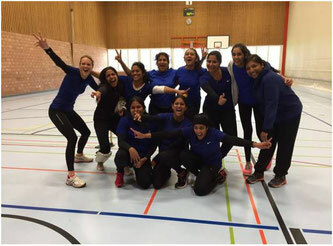 It did not take much time and the buzz on the success and development of Women’s Cricket in Switzerland reached the Austrian Cricket Association and they were keen to invite Switzerland to play for a weekend Cricket tournament at Vienna. The Vienna tournament constituted teams from Belgium, Norway, Austria and two teams from Zurich Sapphires CC. The international Women’s Tournament in Vienna , was definitely a highlight for Women’s Cricket and an important chapter in the history of Women’s Cricket in and around Europe especially for upcoming countries like Switzerland, Austria and Norway. The Tournament was are assurance of the presence of Women’s cricket and the immense potential it has going forward. It was also an opportunity for Women Cricketers to share their experience and a learning curve for each one of us. Mr. Alex Mackay, President of Cricket Switzerland for his constant motivation and support. Mr. Patrick Henderson, President and coach of Zurich Crickets Cricket Club, for training us and Zurich Crickets for supporting us with the cricket facilities. Last but not the least all the members of Zurich Sapphires Cricket Club, for supporting and trusting this initiative and for the courage to pave way for other women cricketers. Simply outstanding!! As we look forward to a new year with new challenges, I would like to wish all the Cricket enthusiasts the very best and a great Cricket Season ahead.